The factory oil filter housing cap on your Audi doesn't jive with the rest of the engine bay's fine materials. 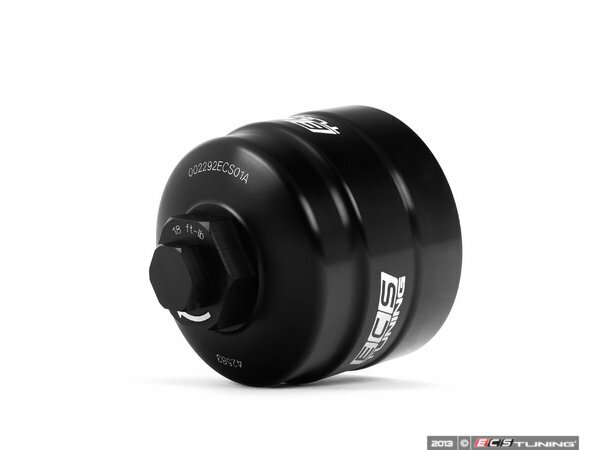 The super-slick black billet aluminum cap by ECS corrects this oversight, while adding another dimension of increased longevity, durability, and ease of use. Machined from solid T6061-T6 aluminum, the housing cover is black anodized for hardness and performance styling. The integral 21mm hex head makes it easy to remove and torque the cover using a common wrench size, eliminating the need to purchase a special-sized socket. For convenience, the cover has the correct tightening torque prominently etched in white, and uses the stock filter cartridge and sealing o-ring, requiring no special seal or gasket. With this product, ECS Tuning R&D has thoroughly addressed the concern for oil housing cover cracks and leaks without overlooking your engine bay aesthetics.